Altair Industries offers cost effective robots and robotic systems for material handling, robotic dispensing, clean room operation, robotic assembly, welding, and palletizing. Altair Industries is an integrator for Fanuc Robotics Corporation. Fanuc offers robots for low to high payload applications, including material handling, palletizing, painting, welding, and dispensing. We provide quality robt systems using this comprehensive line from Fanuc Robotics. Altair Industries is pleased to offer the Janome Industrial Products line of tabletop robots and robot systems. Contact us for more information on these high speed precision products. 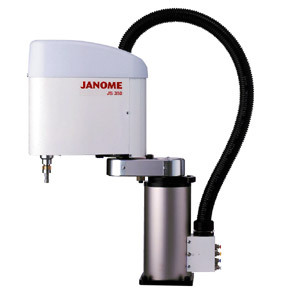 The Janome JS-Series HI SPEED SCARA arm robot, available in 250mm, 350mm, 450mm, 550mm, 650mm, 750mm, 880mm, and 1000mm radius reach. Altair manufactures custom and standard two and three axis gantry robots powered by precision servo drives and ball screw actuators. Contructed with a heavy wall square tube welded steel frame, these robots are extremly rigid and precise. Altair Industries robots and robotic systems are flexible, cost effective industrial solutions that will save costs and increase quality. We specialize in providing cost effective robotic systems using tabletop, articulated arm, or scara robots for robotic assembly, robotic dispensing, and many other applications. Please contact us for help with your application.